The FTD® Thanks Bouquet is a simply gorgeous way to send your gratitude and thanks to friends, family and loved ones near and far! Bright yellow roses are surrounded by white traditional daisies, hot pink mini carnations, yellow button poms and lush greens to create an impressive flower arrangement. 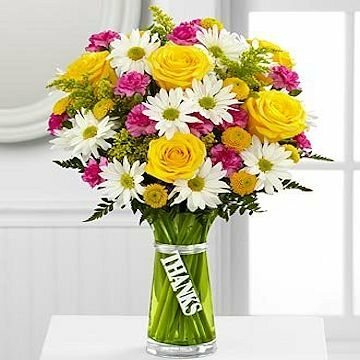 Presented in a designer green glass vase with a silver metallic decorative tag stating, "Thanks", dangling from the neck, this mixed flower bouquet is a wonderful gift to send as a thank you to any of the deserving people in your life. Standard bouquet includes 10 stems. Approximately 16"H x 12"W.
Deluxe bouquet includes 15 stems. Approximately 17"H x 13"W.
Premium bouquet includes 20 stems. Approximately 18"H x 14"W.